A leading neuroscientist says Kurzweil’s Singularity isn’t going to happen. Instead, humans will assimilate machines. “The brain is not computable and no engineering can reproduce it,” says Nicolelis, author of several pioneering papers on brain-machine interfaces. The Singularity, of course, is that moment when a computer super-intelligence emerges and changes the world in ways beyond our comprehension. Among the idea’s promoters are futurist Ray Kurzweil, recently hired on at Google as a director of engineering and who has been predicting that not only will machine intelligence exceed our own but that people will be able to download their thoughts and memories into computers (see “Ray Kurzweil Plans to Create a Mind at Google—and Have It Serve You”). The debate over whether the brain is a kind of computer has been running for decades. Many scientists think it’s possible, in theory, for a computer to equal the brain given sufficient computer power and an understanding of how the brain works. But Nicolelis is in a camp that thinks that human consciousness (and if you believe in it, the soul) simply can’t be replicated in silicon. That’s because its most important features are the result of unpredictable, non-linear interactions amongst billions of cells, Nicolelis says. The neuroscientist, originally from Brazil, instead thinks that humans will increasingly subsume machines (an idea, incidentally, that’s also part of Kurzweil’s predictions). In a study published last week, for instance, Nicolelis’ group at Duke used brain implants to allow mice to sense infrared light, something mammals can’t normally perceive. They did it by wiring a head-mounted infrared sensor to electrodes implanted into a part of the brain called the somatosensory cortex. The experiment, in which several mice were able to follow sensory cues from the infrared detector to obtain a reward, was the first ever to use a neural implant to add a new sense to an animal, Nicolelis says. That’s important because the human brain has evolved to take the external world—our surroundings and the tools we use—and create representations of them in our neural pathways. As a result, a talented basketball player perceives the ball “as just an extension of himself” says Nicolelis. Similarly, Nicolelis thinks in the future humans with brain implants might be able to sense X-rays, operate distant machines, or navigate in virtual space with their thoughts, since the brain will accommodate foreign objects including computers as part of itself. Recently, Nicolelis’s Duke lab has been looking to put an exclamation point on these ideas. In one recent experiment, they used a brain implant so that a monkey could control a full-body computer avatar, explore a virtual world, and even physically sense it. In other words, the human brain creates models of tools and machines all the time, and brain implants will just extend that capability. Nicolelis jokes that if he ever opened a retail store for brain implants, he’d call it Machines“R”Us. But, if he’s right, us ain’t machines, and never will be. Researchers exploit the strange properties of a liquid metamaterial to watch Minkowski spacetimes leap in out and of existence. Metamaterials are synthetic substances with nanoscale structures that manipulate light. This ability to steer photons makes them the enabling technology behind invisibility cloaks and has generated intense interest from researchers. The ability to guide light has more profound consequences, however. Various theoreticians have pointed out that there is a formal mathematical analogy between the way certain metamaterials bend light and the way spacetime does the same thing in general relativity. In fact, it ought to be possible to make metamaterials that mimic the behaviour of not only our own spacetime but also many others that cosmologist merely dream about. Indeed, a couple of years ago we looked at a suggestion by Igor Smolyaninov at the University of Maryland in College Park that it ought to be possible to use metamaterials to create a multiverse in which different regions of the material corresponded to universes with different properties. Today, Smolyaninov and a couple of buddies announce the extraordinary news that they have done exactly this. They’ve created a metamaterial containing many “universes” that are mathematically analogous to our own, albeit in the three dimensions rather than four. “These regions behave as transient 2+1 dimensional Minkowski spacetimes which temporarily appear and disappear inside a larger metamaterial “multiverse”,” they say. The experiment is relatively straightforward. Metamaterials are usually hard to engineer because they are based on nanoscale structures. However, Smolyaninov and pals have instead exploited the self-assembling nature of cobalt nanoparticles suspended in kerosene. Cobalt is ferromagnetic so the nanoparticles tend to become aligned in a magnetic field. 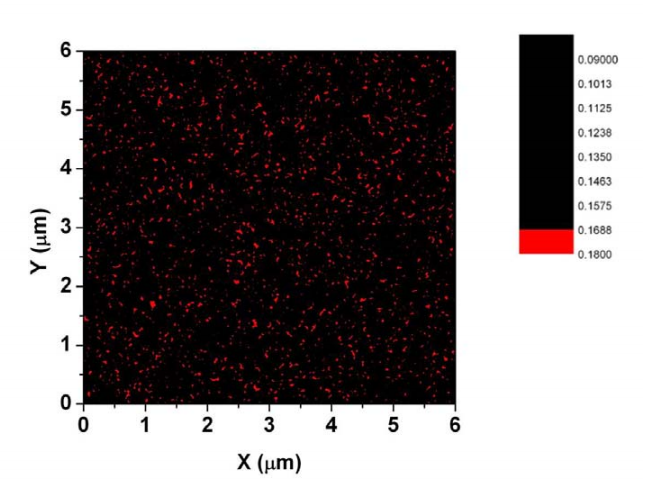 In fact, if the density of nanoparticles is high enough, the field causes them to line up in columns. When this happens, the nanocolumns form a metamaterial which is mathematically equivalent to a 2+1 Minkowski spacetime. So light passing through behaves as if this region has one dimension of time, aligned with the nanocolumns, and two dimensions of space, perpendicular to the nanocolumns. That creates a single Minkowski universe. The trick that Smolyaninov and pals have pulled off is to create a multiverse containing many Minkowski spacetimes . The secret here is to keep the density of nanoparticles just below the threshold required to form nanocolums. That’s just over 8 per cent of the fluid by volume in this case. When that happens, natural variations in the density cause nanocolumns to form in small regions of the liquid. In effect, tiny universes are leaping in and out of existence. Smolyaninov and co can even “see” these universes by their effect on polarised light passing through the fluid. That’s a fascinating result that demonstrates the potential of self-organisation to create metamaterials. Smolyaninov has also suggested in the past that this kind work might give physicists a way to study new kinds of optical devices since photons can be made to behave like massive or massless particles, depending on the properties of their “universe”. Clearly there’s more fun to be had here. Ref: arxiv.org/abs/1301.6055: Experimental Demonstration Of Metamaterial “Multiverse” In A Ferrofluid. Again, some fascinating spatial and perceptual properties coming out from research in metamaterials. Even so it happens at nanoscales. It is an unsigned paper, so it certainly need to be cross-checked, which I haven't done (time, time...)! But I post it nevertheless as it points out some believable consequences, yet very dark. As many people say now, we don't have much time left to start acting, strong (7-10 years). Even if greenhouse emissions stopped overnight the concentrations already in the atmosphere would still mean a global rise of between 0.5 and 1C. A shift of a single degree is barely perceptible to human skin, but it’s not human skin we’re talking about. It’s the planet; and an average increase of one degree across its entire surface means huge changes in climatic extremes. Six thousand years ago, when the world was one degree warmer than it is now, the American agricultural heartland around Nebraska was desert. It suffered a short reprise during the dust- bowl years of the 1930s, when the topsoil blew away and hundreds of thousands of refugees trailed through the dust to an uncertain welcome further west. The effect of one-degree warming, therefore, requires no great feat of imagination. What’s bad for America will be worse for poorer countries closer to the equator. It has beencalculated that a one-degree increase would eliminate fresh water from a third of the world’s land surface by 2100. Again we have seen what this means. There was an incident in the summer of 2005: One tributary fell so low that miles of exposed riverbank dried out into sand dunes, with winds whipping up thick sandstorms. As desperate villagers looked out onto baking mud instead of flowing water, the army was drafted in to ferry precious drinking water up the river – by helicopter, since most of the river was too low to be navigable by boat. The river in question was not some small, insignificant trickle in Sussex. It was the Amazon. While tropical lands teeter on the brink, the Arctic already may have passed the point of no return. Warming near the pole is much faster than the global average, with the result that Arctic icecaps and glaciers have lost 400 cubic kilometres of ice in 40 years. Permafrost – ground that has lain frozen for thousands of years – is dissolving into mud and lakes, destabilising whole areas as the ground collapses beneath buildings, roads and pipelines. As polar bears and Inuits are being pushed off the top of the planet, previous predictions are starting to look optimistic. Earlier snowmelt means more summer heat goes into the air and ground rather than into melting snow, raising temperatures in a positive feedback effect. More dark shrubs and forest on formerly bleak tundra means still more heat is absorbed by vegetation. Out at sea the pace is even faster. Whilst snow-covered ice reflects more than 80% of the sun’s heat, the darker ocean absorbs up to 95% of solar radiation. Once sea ice begins to melt, in other words, the process becomes self-reinforcing. More ocean surface is revealed, absorbing solar heat, raising temperatures and making it unlikelier that ice will re-form next winter. The disappearance of 720,000 square kilometres of supposedly permanent ice in a single year testifies to the rapidity of planetary change. If you have ever wondered what it will feel like when the Earth crosses a tipping point, savour the moment. Mountains, too, are starting to come apart. In the Alps, most ground above 3,000 metres is stabilised by permafrost. In the summer of 2003, however, the melt zone climbed right up to 4,600 metres, higher than the summit of the Matterhorn and nearly as high as Mont Blanc. With the glue of millennia melting away, rocks showered down and 50 climbers died. As temperatures go on edging upwards, it won’t just be mountaineers who flee. Whole towns and villages will be at risk. Some towns, like Pontresina in eastern Switzerland, have already begun building bulwarks against landslides. At the opposite end of the scale, low-lying atoll countries such as the Maldives will be preparing for extinction as sea levels rise, and mainland coasts – in particular the eastern US and Gulf of Mexico, the Caribbean and Pacific islands and the Bay of Bengal – will be hit by stronger and stronger hurricanes as the water warms. Hurricane Katrina, which in 2005 hit New Orleans with the combined impacts of earthquake and flood, was a nightmare precursor of what the future holds. Most striking of all was seeing how people behaved once the veneer of civilisation had been torn away. Most victims were poor and black, left to fend for themselves as the police either joined in the looting or deserted the area. Four days into the crisis, survivors were packed into the city’s Superdome, living next to overflowing toilets and rotting bodies as gangs of young men with guns seized the only food and water available. Perhaps the most memorable scene was a single military helicopter landing for just a few minutes, its crew flinging food parcels and water bottles out onto the ground before hurriedly taking off again as if from a war zone. In scenes more like a Third World refugee camp than an American urban centre, young men fought for the water as pregnant women and the elderly looked on with nothing. Don’t blame them for behaving like this, I thought. It’s what happens when people are desperate. Chance of avoiding one degree of global warming: zero. At this level, expected within 40 years, the hot European summer of 2003 will be the annual norm. Anything that could be called a heatwave thereafter will be of Saharan intensity. Even in average years, people will die of heat stress. The first symptoms may be minor. A person will feel slightly nauseous, dizzy and irritable. It needn’t be an emergency: an hour or so lying down in a cooler area, sipping water, will cure it. But in Paris, August 2003, there were no cooler areas, especially for elderly people. Once body temperature reaches 41C (104F) its thermoregulatory system begins to break down. Sweating ceases and breathing becomes shallow and rapid. The pulse quickens, and the victim may lapse into a coma. Unless drastic measures are taken to reduce the body’s core temperature, the brain is starved of oxygen and vital organs begin to fail. Death will be only minutes away unless the emergency services can quickly get the victim into intensive care. From the beech forests of northern Europe to the evergreen oaks of the Mediterranean, plant growth across the whole landmass in 2003 slowed and then stopped. Instead of absorbing carbon dioxide, the stressed plants began to emit it. Around half a billion tonnes of carbon was added to the atmosphere from European plants, equivalent to a twelfth of global emissions from fossil fuels. This is a positive feedback of critical importance, because it suggests that, as temperatures rise, carbon emissions from forests and soils will also rise. If these land-based emissions are sustained over long periods, global warming could spiral out of control. In the two-degree world, nobody will think of taking Mediterranean holidays. The movement of people from northern Europe to the Mediterranean is likely to reverse, switching eventually into a mass scramble as Saharan heatwaves sweep across the Med. People everywhere will think twice about moving to the coast. When temperatures were last between 1 and 2C higher than they are now, 125,000 years ago, sea levels were five or six metres higher too. All this “lost” water is in the polar ice that is now melting. Forecasters predict that the “tipping point” for Greenland won’t arrive until average temperatures have risen by 2.7C. The snag is that Greenland is warming much faster than the rest of the world – 2.2 times the global average. “Divide one figure by the other,” says Lynas, “and the result should ring alarm bells across the world. Greenland will tip into irreversible melt once global temperatures rise past a mere 1.2C. The ensuing sea-level ?rise will be far more than the half-metre that ?the IPCC has predicted for the end of the century. Scientists point out that sea levels at the end of the last ice age shot up by a metre every 20 years for four centuries, and that Greenland’s ice, in the words of one glaciologist, is now thinning like mad and flowing much faster than it ought to. Its biggest outflow glacier, Jakobshavn Isbrae, has thinned by 15 metres every year since 1997, and its speed of flow has doubled. At this rate the whole Greenland ice sheet would vanish within 140 years. Miami would disappear, as would most of Manhattan. Central London would be flooded. Bangkok, Bombay and Shanghai would lose most of their area. In all, half of humanity would have to move to higher ground. Not only coastal communities will suffer. As mountains lose their glaciers, so people will lose their water supplies. The entire Indian subcontinent will be fighting for survival. As the glaciers disappear from all but the highest peaks, their runoff will cease to power the massive rivers that deliver vital freshwater to hundreds of millions. Water shortages and famine will be the result, destabilising the entire region. And this time the epicentre of the disaster won’t be India, Nepal or Bangladesh, but nuclear-armed Pakistan. Everywhere, ecosystems will unravel as species either migrate or fall out of synch with each other. By the time global temperatures reach two degrees of warming in 2050, more than a third of all living species will face extinction. Chance of avoiding two degrees of global warming: 93%, but only if emissions of greenhouse gases are reduced by 60% over the next 10 years. Up to this point, assuming that governments have planned carefully and farmers have converted to more appropriate crops, not too many people outside subtropical Africa need have starved. Beyond two degrees, however, preventing mass starvation will be as easy as halting the cycles of the moon. First millions, then billions, of people will face an increasingly tough battle to survive. To find anything comparable we have to go back to the Pliocene – last epoch of the Tertiary period, 3m years ago. There were no continental glaciers in the northern hemisphere (trees grew in the Arctic), and sea levels were 25 metres higher than today’s. In this kind of heat, the death of the Amazon is as inevitable as the melting of Greenland. The paper spelling it out is the very one whose apocalyptic message so shocked in 2000. Scientists at the Hadley centre feared that earlier climate models, which showed global warming as a straightforward linear progression, were too simplistic in their assumption that land and the oceans would remain inert as their temperatures rose. Correctly as it would turn out, they predicted positive feedback. Warmer seas absorb less carbon dioxide, leaving more to accumulate in the atmosphere and intensify global warming. On land, matters would be even worse. Huge amounts of carbon are stored in the soil, the half-rotted remains of dead vegetation. The generally accepted estimate is that the soil carbon reservoir contains some 1600 gigatonnes, more than double the entire carbon content of the atmosphere. As soil warms, bacteria accelerate the breakdown of this stored carbon, releasing it into the atmosphere. The end of the world is nigh. A three-degree increase in global temperature – possible as early as 2050 – would throw the carbon cycle into reverse. Instead of absorbing carbon dioxide, vegetation and soils start to release it. So much carbon pours into the atmosphere that it pumps up atmospheric concentrations by 250 parts per million by 2100, boosting global warming by another 1.5C. In other words, the Hadley team had discovered that carbon-cycle feedbacks could tip the planet into runaway global warming by the middle of this century – much earlier than anyone had expected. Confirmation came from the land itself. Climate models are routinely tested against historical data. In this case, scientists checked 25 years’ worth of soil samples from 6,000 sites across the UK. The result was another black joke. As temperatures gradually rose the scientists found that huge amounts of carbon had been released naturally from the soils. They totted it all up and discovered – irony of ironies – that the 13m tonnes of carbon British soils were emitting annually was enough to wipe out all the country’s efforts to comply with the Kyoto Protocol.” All soils will be affected by the rising heat, but none as badly as the Amazon’s. “Catastrophe” is almost too small a word for the loss of the rainforest. Its 7m square kilometres produce 10% of the world’s entire photosynthetic output from plants. Drought and heat will cripple it; fire will finish it off. In human terms, the effect on the planet will be like cutting off oxygen during an asthma attack. In the US and Australia, people will curse the climate-denying governments of Bush and Howard. No matter what later administrations may do, it will not be enough to keep the mercury down. With new “super-hurricanes” growing from the warming sea, Houston could be destroyed by 2045, and Australia will be a death trap. “Farming and food production will tip into irreversible decline. Salt water will creep up the stricken rivers, poisoning ground water. Higher temperatures mean greater evaporation, further drying out vegetation and soils, and causing huge losses from reservoirs. In state capitals, heat every year is likely to kill between 8,000 and 15,000 mainly elderly people. It is all too easy to visualise what will happen in Africa. In Central America, too, tens of millions will have little to put on their tables. Even a moderate drought there in 2001 meant hundreds of thousands had to rely on food aid. This won’t be an option when world supplies are stretched to breaking point (grain yields decline by 10% for every degree of heat above 30C, and at 40C they are zero). Nobody need look to the US, which will have problems of its own. As the mountains lose their snow, so cities and farms in the west will lose their water and dried-out forests and grasslands will perish at the first spark. The Indian subcontinent meanwhile will be choking on dust. All of human history shows that, given the choice between starving in situ and moving, people move. In the latter part of the century tens of millions of Pakistani citizens may be facing this choice. Pakistan may find itself joining the growing list of failed states, as civil administration collapses and armed gangs seize what little food is left. As the land burns, so the sea will go on rising. Even by the most optimistic calculation, 80% of Arctic sea ice by now will be gone, and the rest will soon follow. New York will flood; the catastrophe that struck eastern England in 1953 will become an unremarkable regular event; and the map of the Netherlands will be torn up by the North Sea. Everywhere, starving people will be on the move – from Central America into Mexico and the US, and from Africa into Europe, where resurgent fascist parties will win votes by promising to keep them out. Chance of avoiding three degrees of global warming: poor if the rise reaches two degrees and triggers carbon-cycle feedbacks from soils and plants. The stream of refugees will now include those fleeing from coasts to safer interiors – millions at a time when storms hit. Where they persist, coastal cities will become fortified islands. The world economy, too, will be threadbare. As direct losses, social instability and insurance payouts cascade through the system, the funds to support displaced people will be increasingly scarce. Sea levels will be rampaging upwards – in this temperature range, both poles are certain to melt, causing an eventual rise of 50 metres. “I am not suggesting it would be instantaneous. In fact it would take centuries, and probably millennia, to melt all of the Antarctic’s ice. But it could yield sea-level rises of a metre or so every 20 years – far beyond our capacity to adapt.Oxford would sit on one of many coastlines in a UK reduced to an archipelago of tiny islands. More immediately, China is on a collision course with the planet. By 2030, if its people are consuming at the same rate as Americans, they will eat two-thirds of the entire global harvest and burn 100m barrels of oil a day, or 125% of current world output. That prospect alone contains all the ingredients of catastrophe. But it’s worse than that: “By the latter third of the 21st century, if global temperatures are more than three degrees higher than now, China’s agricultural production will crash. It will face the task of feeding 1.5bn much richer people – 200m more than now – on two thirds of current supplies.” For people throughout much of the world, starvation will be a regular threat; but it will not be the only one. The summer will get longer still, as soaring temperatures reduce forests to tinderwood and cities to boiling morgues. Temperatures in the Home Counties could reach 45C – the sort of climate experienced today in Marrakech. Droughts will put the south-east of England on the global list of water-stressed areas, with farmers competing against cities for dwindling supplies from rivers and reservoirs. Air-conditioning will be mandatory for anyone wanting to stay cool. This in turn will put ever more stress on energy systems, which could pour more greenhouse gases into the air if coal and gas-fired power stations ramp up their output, hydroelectric sources dwindle and renewables fail to take up the slack. The abandonment of the Mediterranean will send even more people north to “overcrowded refuges in the Baltic, Scandinavia and the British Isles. Britain will have problems of its own. As flood plains are more regularly inundated, a general retreat out of high risk areas is likely. Millions of people will lose their lifetime investments in houses that become uninsurable and therefore unsaleable? The Lancashire/Humber corridor is expected to be among the worst affected regions, as are the Thames Valley, eastern Devon and towns around the already flood-prone Severn estuary like Monmouth and Bristol. The entire English coast from the Isle of Wight to Middlesbrough is classified as at ‘very high’ or ‘extreme’ risk, as is the whole of Cardigan Bay in Wales. One of the most dangerous of all feedbacks will now be kicking in – the runaway thaw of permafrost. Scientists believe at least 500 billion tonnes of carbon are waiting to be released from the Arctic ice, though none yet has put a figure on what it will add to global warming. One degree? Two? Three? The pointers are ominous. As with Amazon collapse and the carbon-cycle feedback in the three-degree worldstabilising global temperatures at four degrees above current levels may not be possible. If we reach three degrees, therefore, that leads inexorably to four degrees, which leads inexorably to five? Chance of avoiding four degrees of global warming: poor if the rise reaches three degrees and triggers a runaway thaw of permafrost. We are looking now at an entirely different planet. Ice sheets have vanished from both poles; rainforests have burnt up and turned to desert; the dry and lifeless Alps resemble the High Atlas; rising seas are scouring deep into continental interiors. One temptation may be to shift populations from dry areas to the newly thawed regions of the far north, in Canada and Siberia. Even here, though, summers may be too hot for crops to be grown away from the coasts; and there is no guarantee that northern governments will admit southern refugees. Lynas recalls James Lovelock’s suspicion that Siberia and Canada would be invaded by China and the US, each hammering another nail into humanity’s coffin. Any armed conflict, particularly involving nuclear weapons, would of course further increase the planetary surface area uninhabitable for humans. When temperatures were at a similar level 55m years ago, following a very sudden burst of global warming in the early Eocene, alligators and other subtropical species were living high in the Arctic. What had caused the climate to flip? Suspicion rests on methane hydrate – “an ice-like combination of methane and water that forms under the intense cold and pressure of the deep sea”, and which escapes with explosive force when tapped. Evidence of a submarine landslide off Florida, and of huge volcanic eruptions under the North Atlantic, raises the possibility of trapped methane – a greenhouse gas 20 times more potent than carbon dioxide – being released in a giant belch that pushed global temperatures through the roof. Summer heatwaves scorched the vegetation out of continental Spain, leaving a desert terrain which was heavily eroded by winter rainstorms. Palm mangroves grew as far north as England and Belgium, and the Arctic Ocean was so warm that Mediterranean algae thrived. In short, it was a world much like the one we are heading into this century. Although the total amount of carbon in the atmosphere during the Paleocene-Eocene thermal maximum, or PETM, as scientists call it, was more than today’s, the rate of increase in the 21st century may be 30 times faster. It may well be the fastest increase the world has ever seen – faster even than the episodes that caused catastrophic mass extinctions. Globalism in the five-degree world will break down into something more like parochialism. Customers will have nothing to buy because producers will have nothing to sell. With no possibility of international aid, migrants will have to force their way into the few remaining habitable enclaves and fight for survival. Where no refuge is available, civil war and a collapse into racial or communal conflict seems the likely outcome. Isolated survivalism, however, may be as impracticable as dialling for room service. How many of us could really trap or kill enough game to feed a family? Even if large numbers of people did successfully manage to fan out into the countryside, wildlife populations would quickly dwindle under the pressure. Supporting a hunter-gatherer lifestyle takes 10 to 100 times the land per person that a settled agricultural community needs. A large-scale resort to survivalism would turn into a further disaster for biodiversity as hungry humans killed and ate anything that moved. Including, perhaps, each other. Invaders do not take kindly to residents denying them food. History suggests that if a stockpile is discovered, the householder and his family may be tortured and killed. Look for comparison to the experience of present-day Somalia, Sudan or Burundi, where conflicts over scarce land and food are at the root of lingering tribal wars and state collapse. Chance of avoiding five degrees of global warming: negligible if the rise reaches four degrees and releases trapped methane from the sea bed. Although warming on this scale lies within the IPCC’s officially endorsed range of 21st-century possibilities, climate models have little to say about what Lynas, echoing Dante, describes as “the Sixth Circle of Hell”. To see the most recent climatic lookalike, we have to turn the geological clock back between 144m and 65m years, to the Cretaceous, which ended with the extinction of the dinosaurs. There was an even closer fit at the end of the Permian, 251m years ago, when global temperatures rose by – yes – six degrees, and 95% of species were wiped out. That episode was the worst ever endured by life on Earth, the closest the planet has come to ending up a dead and desolate rock in space.” On land, the only winners were fungi that flourished on dying trees and shrubs. At sea there were only losers. Warm water is a killer. Less oxygen can dissolve, so conditions become stagnant and anoxic. Oxygen-breathing water-dwellers – all the higher forms of life from plankton to sharks – face suffocation. Warm water also expands, and sea levels rose by 20 metres.” The resulting “super-hurricanes” hitting the coasts would have triggered flash floods that no living thing could have survived. There are aspects of the so-called “end-Permian extinction” that are unlikely to recur – most importantly, the vast volcanic eruption in Siberia that spread magma hundreds of metres thick over an area bigger than western Europe and shot billions of tonnes of CO2 into the atmosphere. That is small comfort, however, for beneath the oceans, another monster stirred – the same that would bring a devastating end to the Palaeocene nearly 200m years later, and that still lies in wait today. Methane hydrate. What happens when warming water releases pent-up gas from the sea bed: First, a small disturbance drives a gas-saturated parcel of water upwards. As it rises, bubbles begin to appear, as dissolved gas fizzles out with reducing pressure – just as a bottle of lemonade overflows if the top is taken off too quickly. These bubbles make the parcel of water still more buoyant, accelerating its rise through the water. As it surges upwards, reaching explosive force, it drags surrounding water up with it. At the surface, water is shot hundreds of metres into the air as the released gas blasts into the atmosphere. Shockwaves propagate outwards in all directions, triggering more eruptions nearby. The eruption is more than just another positive feedback in the quickening process of global warming. Unlike CO2, methane is flammable. Even in air-methane concentrations as low as 5%, the mixture could ignite from lightning or some other spark and send fireballs tearing across the sky. The effect would be much like that of the fuel-air explosives used by the US and Russian armies – so-called “vacuum bombs” that ignite fuel droplets above a target. According to the CIA, those near the ignition point are obliterated. Those at the fringes are likely to suffer many internal injuries, including burst eardrums, severe concussion, ruptured lungs and internal organs, and possibly blindness.” Such tactical weapons, however, are squibs when set against methane-air clouds from oceanic eruptions. Scientists calculate that they could “destroy terrestrial life almost entirely (251m years ago, only one large land animal, the pig-like lystrosaurus, survived). It has been estimated that a large eruption in future could release energy equivalent to 108 megatonnes of TNT – 100,000 times more than the world’s entire stockpile of nuclear weapons. Not even Lynas, for all his scientific propriety, can avoid the Hollywood ending. “It is not too difficult to imagine the ultimate nightmare, with oceanic methane eruptions near large population centres wiping out billions of people – perhaps in days. Imagine a ‘fuel-air explosive’ fireball racing towards a city – London, say, or Tokyo – the blast wave spreading out from the explosive centre with the speed and force of an atomic bomb. Buildings are flattened, people are incinerated where they stand, or left blind and deaf by the force of the explosion. Mix Hiroshima with post-Katrina New Orleans to get some idea of what such a catastrophe might look like: burnt survivors battling over food, wandering far and wide from empty cities. Then would come hydrogen sulphide from the stagnant oceans. “It would be a silent killer: imagine the scene at Bhopal following the Union Carbide gas release in 1984, replayed first at coastal settlements, then continental interiors across the world. At the same time, as the ozone layer came under assault, we would feel the sun’s rays burning into our skin, and the first cell mutations would be triggering outbreaks of cancer among anyone who survived. Dante’s hell was a place of judgment, where humanity was for ever punished for its sins. With all the remaining forests burning, and the corpses of people, livestock and wildlife piling up in every continent, the six-degree world would be a harsh penalty indeed for the mundane crime of burning fossil energy. Warming World [newscientistapps.com], developed by Chris Amico and Peter Aldhous for the New Scientist, shows the distribution of ambient temperatures around the world, ranging from 1951 to now. The graphs and maps highlight the changes relative to the average temperatures measured between 1951 to 1980. Users can click anywhere on the map and investigate an entire temperature record for that grid cell, retrieved via NASA's surface temperature analysis database GISTEMP, which is based on 6000 monitoring stations, ships and satellite measurements worldwide. 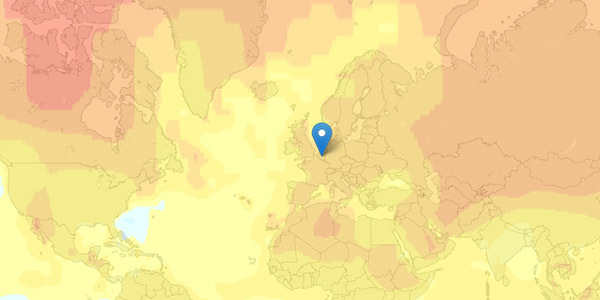 Via the drop-down list at the top, users can also switch between different map overlays that summarize the average temperatures for different 20-year pictures. Accordingly, climate change become visible as the cool blue hues from previous decades are replaced with warm red and yellow hues around the start of the 20th Century. Accordingly, this tool aims to communicate the reality and variability of recorded climate change, and compare that local picture with the trend for the global average temperature.. The accompanying article can be found here. See also Cal-Adapt and Climate Change Media Watch. Read also "An Alarm in the Offing on Climate Change", The New York Times.